Some of the ideas in Paolo Bacigalupi’s excellent Nebula-winning debut novel The Windup Girl are already alarmingly close to reality. In a future world where all the oil is long gone, all energy has to come from food as processed by animals, human or otherwise; when your food crops start dying, it’s a race against time to cook up new genetic variants that can resist the rapid mutations of virulent viruses and parasites… which means big money for whoever has a patent on the right genetic sequences, and perpetual debt (or intellectual property piracy) for everyone else. “Eventually it will reach North America and Europe,” says Ronnie Coffman, a plant-breeding scientist at Cornell University in Ithaca, New York. 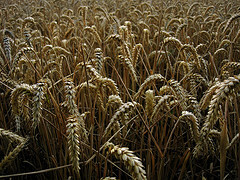 He warns that in the next few years, farmers across the world will need to replace up to 90% of the current wheat varieties with new, resistant varieties to ensure crops are protected against the fungus. That sound you can hear? Monsanto’s board of directors rubbing their fat hands together in delight. I’m of the opinion that the “Frankenstein foods” panic about GM crops is reactionary foolishness, and that we badly need engineered crops to support the world’s population… but I have serious concerns about incumbent intellectual property laws, not to mention the sort of genetic tampering (e.g. neutered seedstock – it’ll grow, but you can’t grow more without paying up for more viable seeds) that could turn that urgent need into a captive-market profit margin that’ll make the fossil fuel multinationals look like corner-store philanthropists. That’s very much a worst-case scenario, of course, but forewarned is fore-armed… and Bacigalupi’s novel (which I really must get round to writing a full review of when my schedule allows) is a timely allegory, as well as a very gripping read. Go buy a copy. GM crops are not the answer to this shameful global situation, but I argue strongly that they provide another tool, another option to try to address the problem. And I do not think those of us sitting in comfortable wealth have a right to deny people the opportunity to improve their production of food. The technology is just that, a technology. Like nuclear technologies (radiotherapy or nuclear weapons) or mobile phones (communication or bomb triggers), how we use it is the main issue. I hope that the plants we have generated provide a subtle use of GM technology that will allow some positive benefits for the developing world. I don’t know how it is in the States, but here in the UK GM crops are a hugely sensitive topic with a sharp polarity of opinion that has been amplified by propaganda, celebrity campaigning and emotional button-pushing from both sides of the debate. Such extreme viewpoints actually end up clouding the issue; somewhere in the shades of grey is a way to use genetic modification safely for the benefit of everyone, but until we start meeting each other half way we leave the field wide open for both poverty and profiteering to continue.